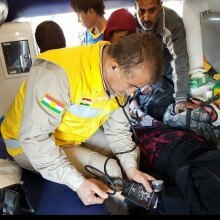 As the conflict in Mosul intensifies and greater numbers of civilians are caught in the crossfire, the United Nations health agency and its partners have increased trauma care services to ensure that patients requiring medical care for injuries have a greater chance of survival. To fully support the health needs resulting from the Mosul operation, WHO requires a total of $65 million of which $14 million, or 21 per cent, has been received. Many hospitals in Mosul have suffered extensive damage and are no longer able to provide health services. Trauma casualty rates remain high near frontline areas, with many trauma cases requiring referral from Mosul to Erbil in northern Iraq. Three field hospitals, with a capacity of 40–50 beds, will soon be established to support access to trauma care to the west and south of Mosul. These hospitals will fill a critical gap, as trauma patients are currently transported to referral hospitals in Erbil, a one- to two-hour drive away. From 17 October 2016 to 18 January 2017, 1610 wounded civilians were sent to Erbil’s two main hospitals.